There is a market near my home suddenly became very busy these days and I could see a big crowd consisting of small children and teenagers standing in front of Shops selling Diyas and Fire crackers. I could see people buying a big list of Groceries to make sweets and savouries and to exchange homemade edible gifts between friends and families for Diwali. Diwali is gearing up every where. I am also getting ready for it and started making sweets and savouries. But this time, I decided to include at least one healthy ingredient in all my recipes. Stating from Urad dal laddu till Diwali you can see me posting healthy stuffs here in my place. Today's recipe also has one healthy ingredient which is nothing but Oats. Also, this burfi can be prepared in Microwave in 5 minutes, kids friendly and addictive. 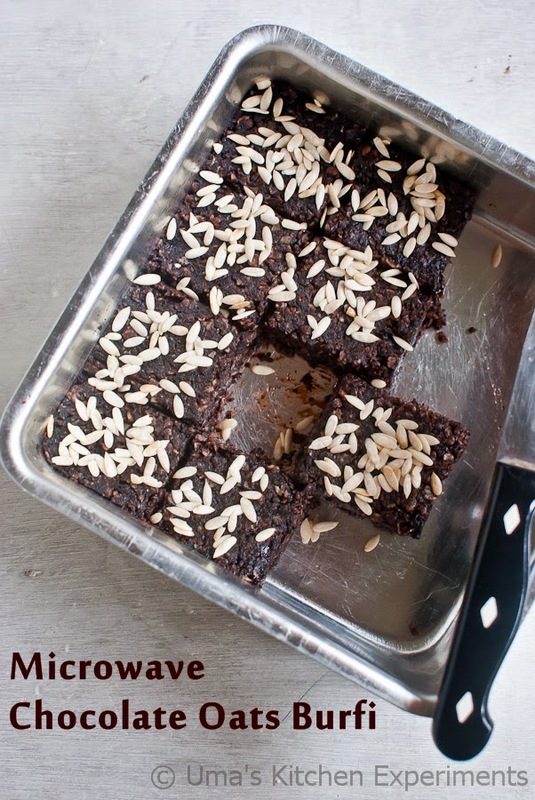 I used the recipe from here which I have been making for the past few years since the method was so easy and needs handy ingredients. 1) In a microwave safe bowl, melt butter and chocolate together. It took 3 minutes for me. 2) After 3 minutes, take out the bowl from microwave. Add oats and milk. Mix well. 3) Add sugar and mix well again. 4) Keep inside the microwave for 2 minutes in high mode. 5) Transfer the entire mixture to the greased pan. Pat it well to get the even surface. 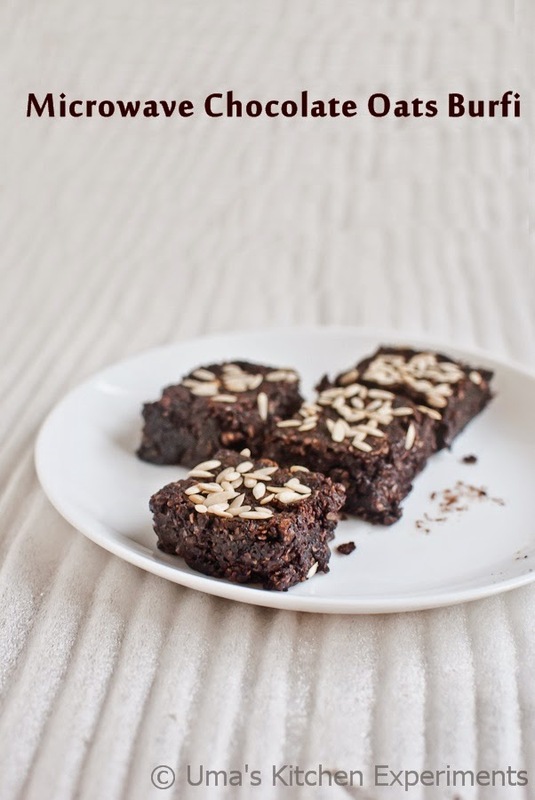 6) Sprinkle with chopped nuts and when it is warm, cut into squares. 7) Cover it with cling wrap and then keep inside the refrigerator or cool down in room temperature till it sets well. 1) You can skip the sugar to get perfect dark chocolate taste. 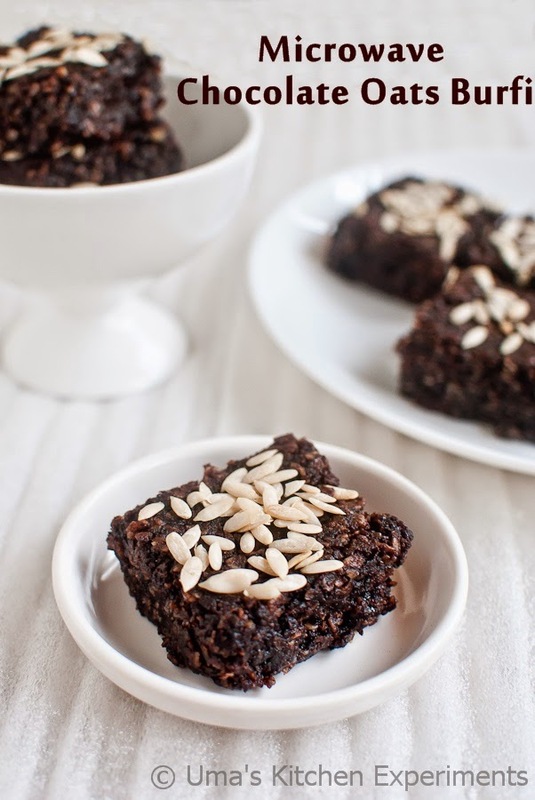 2) These Burfi's are also good to have when it is warm and they taste like brownies. 3) Nuts topping is absolutely your choice. 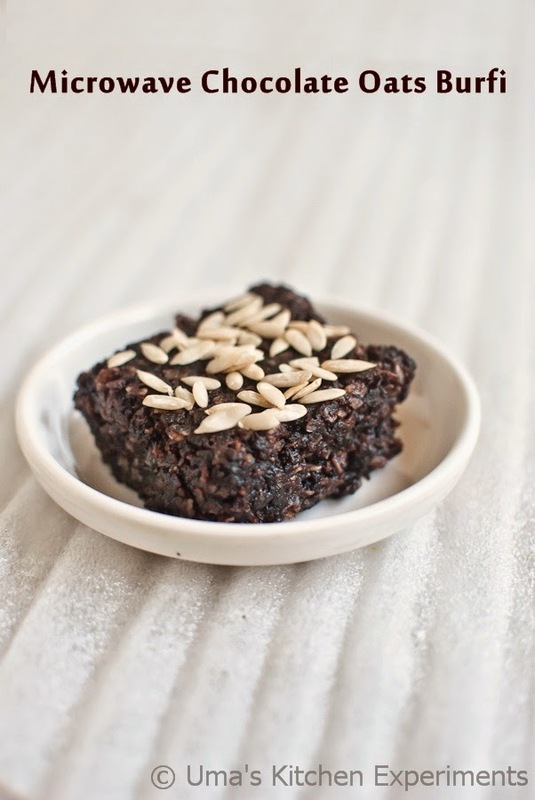 4) I used Morde brand Dark Chocolate and Quakers Quick Cooking Oats. 5) The cooking time varies and it depends upon the Microwave Models. looks very delicious and healthy too..
Hi, can I use chocolate powder instead of dark chocolate? Hi Padma, You can substitute with coco powder. But make sure you added enough sugar to your taste if using unsweetened coco powder and increase the quantity of butter slightly. I have a microwave at home.I will surely make this dish someday.